This award is presented to an individual—a graduate or friend of the university—who exhibits dedication to the RIT community by being active and involved in the university community and beyond. One of RIT’s longest serving staff members now has a new title: RIT’s 2018 Volunteer of the Year. Kathy Carcaci ’95, who retired as manager of staff recruitment and a senior human resources representative in January after 52 ½ years, began her career at RIT in 1965, when she was 18, working in the administration building on Plymouth Avenue in downtown Rochester. She worked for six RIT presidents and witnessed the construction of every new building on RIT’s current campus. She watched RIT transform from a close-knit downtown campus into the sprawling, state-of-the-art community that it is today. During her more than 52 years at RIT, Carcaci has a long list of volunteer activities. She co-chaired or chaired several campus committees, including the 175th anniversary celebration planning committee, the 2002-2006 Faculty/Staff Capital Campaign and the Campus Security Committee. She served as a Greek advisor for many years and was named Outstanding Advisor of the Year. Carcaci said chairing the Capital Campaign was especially meaningful to her because she learned about fundraising and the importance of engagement. She also enjoyed working as a Greek advisor and getting to know the students. She volunteered at the Puttin’ on the RITz Dinner, commencement, ROAR Day, Tiger Walk, RIT United Way Day of Caring and served on the Institute Hearing Board regarding student discipline issues. She also served on the Beautification Committee and was the first to approach artist Albert Paley about donating a large piece of artwork to campus, which resulted in The Sentinel. Carcaci said she is thankful she was given the opportunity to work in an environment where she met people from around the world and could grow as a person. She expects she will continue to stay involved with RIT in some way. Saunders has remained actively engaged in Saunders College of Business and is an advocate for increasing its worldwide recognition. He believes integrating business education with RIT’s internationally recognized technical and creative programs has been immeasurably successful. A lifelong resident of Livingston County in New York, Saunders is known for transforming the truck stop industry, the genesis to diversified interests in energy, auto and truck rental, recreation and tourism, packaged foods, property management, banking and business ventures. 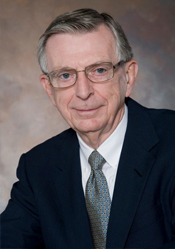 He is an RIT trustee emeritus and was awarded the university’s prestigious Herbert W. Vanden Brul Entrepreneurial Award in 2005 and the Nathaniel Rochester Society award in 2011. The community-minded patron is also the sponsor of the Young Entrepreneurs Academy (YEA!) Saunders Scholars Competition, held at RIT the past two years. Michael Krupnicki, president of Mahany Welding Supply in Rochester and founder of the partner company Rochester Arc + Flame Center, has been honored as RIT's Volunteer of the Year for 2016. Krupnicki graduated from RIT in 1999 from RIT's Executive MBA program. Krupnicki has given back to RIT in many ways, offering classes not available on campus to RIT students. Sculpture, mechanical engineering technology and industrial design students have learned how to weld at his facilities. He estimates nearly 1,000 RIT students have taken credit-bearing classes at his businesses since 2004. "This is how I give back as an alumnus," said Krupnicki. "I get satisfaction knowing that my organizations have contributed to students' education at RIT." In addition, Krupnicki has sponsored the annual Glass Pumpkin Sale and RIT Formula Racing and RIT Baja Racing teams. 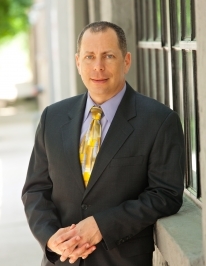 He has hosted team-building activities for Saunders College of Business students at Arc + Flame, volunteered as a judge in campus business competitions and worked as an adjunct professor in Saunders College of Business from 1997 to 2012. He also hires RIT alumni to work in his businesses. "Who would have thought a welding supply business could have an impact on so many college students," he said. "Maybe this will inspire other local alumni with businesses to find creative ways to give back." After co-helming one of the largest RIT alumni chapters for the last nine years and leading the charge on two Big Shot projects, Scott Saldinger ’89, ’91 (film and video) has had his extensive volunteer work recognized as RIT’s 2015 Volunteer of the Year. A passionate alumnus, Saldinger was the driving force behind the 2013 Big Shot of Cowboys Stadium, the largest Big Shot subject ever photographed and the highest attended in the project’s history. Saldinger also organized the 2001 Big Shot of the Alamo, the first Big Shot taken outside of New York. Saldinger also serves as co-president of the Dallas/Fort Worth RIT alumni chapter which has grown to nearly 800 members. Prior to his work with the Dallas alumni chapter, Saldinger was the president of the San Antonio chapter. He is constantly organizing alumni events in Texas to engage fellow alumni and raise money for RIT like the Brick City party, RIT hockey watching party, alumni dinners with RIT president Bill Destler, alumni boat cruises, and many more events. The amount of time and energy that Saldinger donates to support the success of the local Dallas alumni chapter every year is an amazing accomplishment. Along with his work with alumni, Saldinger is a strong supporter of recruiting new college applicants to RIT by representing the university at various local events like photography conferences, local job fairs, and business conferences. Saldinger also contributes to the success of RIT’s co-op program by mentoring co-op students and even opening his home to students when they come to work in Dallas. Lisa Talty likes to tell people that she and her husband, Patrick, are the alumni who never went away. Lisa ’91, ’97 (packaging science, MBA) started attending RIT in 1987. Patrick ’92, ’02 (criminal justice, MBA) took a few years off between degrees and finished in the Executive MBA program 15 years later. They are active supporters of the Nathaniel Rochester Society. They both have been adjunct professors. And they volunteer their time whenever they can. The Taltys are RIT’s Volunteers of the Year for 2014 and will receive the award during the Presidents’ Alumni Ball on Oct. 17 during Brick City Homecoming & Family Weekend. Patrick began his volunteer work after completing his MBA in 2002, working on development activities for the B. Thomas Golisano College of Computing and Information Sciences. His employer, Info Directions Inc. (now known as IDI Billing Solutions), had ties to the computing college. He is now the company’s vice president of operations and chief security officer. In 2003, he became involved with the Information Technology Advisory Board, has taught classes in Saunders College of Business and has been on the Nathaniel Rochester Society Executive Committee and is an NRS committee chairman. In 2008, he became an Alumni Association board member. Lisa also began volunteering in 2002 with the Capital Campaign Committee, attending the kickoff event a few days before their daughter, Clare, was born. She has taught as an adjunct professor in packaging science since 2003 and has been active with the Packaging Industry Advisory Board. She put her career as a packaging engineer on hold to be a stay-at-home mom. Patrick and Lisa have three children: Clare, 11; John, 8; and Colleen, 6. “In our volunteer capacity, we are cheerleaders for RIT and try to show and explain our enthusiasm for the university and how it benefits from donors,” Lisa said. Patrick said that they volunteer because they can recognize the results of their work in areas such as increased alumni contributions to scholarships and alumni involvement. Angie (Donnell) Officer ’88 (graphic design) has always kept busy in her personal and professional lives. 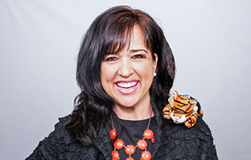 She worked as an art director and handled public relations before joining Sprint Corp. in 1992 as an account manager for relay services in New Hampshire, Connecticut and Virginia. Today, she’s a senior implementation program manager for Sprint Relay, overseeing relay service in 32 states, as well as serving as chairperson of the National Technical Institute for the Deaf Alumni Association Board of Directors. She was named RIT’s volunteer of the year and will receive the award during Brick City Homecoming & Family Weekend Oct. 10-13, which is also when NTID will celebrate its 45th anniversary. She says the best part of being NTID Alumni Association chair is working with the dynamic board members, staff, alumni and students to ensure the best quality education and career opportunities for RIT/NTID students. It’s hard for Officer to pick a favorite memory from her time as a student, but a life-changing moment occurred when she met fellow student David Officer ’87 (applied computer technology), whom she’d later marry. They just celebrated their 21st wedding anniversary. She also keeps in touch with close girlfriends she met at RIT/NTID in 1983. “We just celebrated 30 years of friendship,” she says. A native of Geneva, Ill., Officer now lives in Great Falls, Va., with David and their daughter, Lexi. She enjoys spending her free time volunteering. "This award recognizes Donald's dedication and service to the RIT community; including his impact on student success and his demonstration of outstanding leadership skills. This award not only honors Donald for his successes, but also expresses our appreciation for his support of the Institute." Donald N. Boyce is the retired Chairman and Chief Executive Officer of IDEX Corporation, a New York Stock Exchange listed international manufacturing company headquartered in Lake Forest, Illinois. IDEX is a producer of proprietary industrial products, manufactured and sold worldwide, including a variety of pumps, dispensing equipment, banding and clamping devices, safety equipment and other industrial products. Mr. Boyce joined a division of IDEX's predecessor in 1969, two years after earning his B.S. in Business Administration from R.I.T's College of Continuing Education. Boyce has served as a director of a number of public companies, including IDEX, Houdaille Industries, Walter Industries, United Dominion Industries, Morgan Products, Metromail Corporation, PT Components, Southeast Banking Corporation and Mueller Water Products. He currently serves as Chair of the Board of Trustees at Rochester Institute of Technology, and has served as a board member of several non-profit organizations, including Garrett-Evangelical Theological Seminary (Life Trustee and past Board Chair); Humboldt Park Social Services; United Methodist Clergy Fund - Chicago (Past President); Lake Forest Symphony Orchestra; Oakfield-Alabama Central School Board of Education and local churches where he has lived. Boyce and his wife of more than 50 years, Jeris, are the parents of four children and have eleven grandchildren. They reside in Lake Forest, Illinois. "This award recognizes Christine's dedication and service to the RIT community; including her impact on student success and her demonstration of outstanding leadership skills. This award not only honors Christine for her successes, but also expresses our appreciation for her support of the University." Christine Whitman began her lifelong relationship with RIT while she was building CVC Products, a manufacturer of thin film process equipment used for making disk drive recording heads, semiconductor devices and optical components. Her company was growing rapidly and required innovative, highly skilled engineers and scientists with "Can Do" attitudes who were prepared to push the limits of the Laws of Physics. She found exactly these characteristics in the hundreds of RIT students that she has hired over the years initially at CVC and later at other companies within her portfolio of businesses. At CVC, she and her team grew annual revenue ~10X over 10 years, winning the Rochester Top 100 fastest growing private company twice before completing a successful IPO and in 2000, the company was acquired by Veeco Instruments. A serial entrepreneur, Christine is currently Chairman, CEO and President of Complemar Partners, Inc, a growing integrated logistics and supply chain management company with operations in Rochester and Buffalo, NY and Sparks, Nevada. She also serves as the Managing Partner of CSW Equity Partners, where she oversees a portfolio of equity investments in a number of early stage technology companies and serves on several of their Boards. Christine began her volunteer relationship with RIT by serving on the Advisory Board for the Kate Gleason College of Engineering in the early 1990s. She joined the RIT Board of Trustees in 1997 and has served on numerous committees over the years. 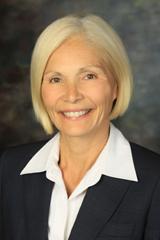 She is currently Vice Chairman of the Board of Trustees, Chair of the Strategic Planning Committee, a member of RIT's Venture Creations Board, a member of the RIT Global Delivery Corporation, a member of the Education Committee and has served on numerous other committees including the Presidential Search Committee. 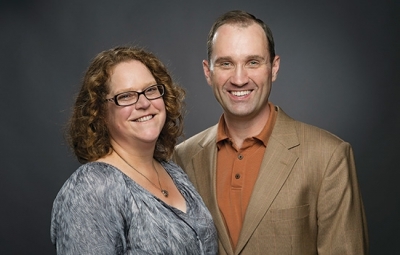 In 2000, Christine and her husband, Steve established the Whitman Family Scholarship aimed at encouraging students to pursue studies in science and technology areas. In 2000, she received the Herbert W VandenBrul Award for Entrepreneurship and in 2004, Christine received the Nathanial Rochester Award for her dedication communicating and supporting RIT's vision of excellence in delivering career-focused, technology based education. Economic Development and preparing students to be skilled in science and technology are two key area of focus for Chris' volunteerism and philanthropy. She is founder of the Greater Rochester Enterprise and the Rochester Angel Network. She is a past Chair of the Board of Trustees of the Rochester Museum and Science Center, serves on the Board of Trustees of the George Eastman House and serves as a member of the Board of High Technology of Rochester. In response to the question how RIT has contributed to her success, Christine attributes the success of her companies to the tremendously prepared RIT graduates who worked with her. She says that volunteering at RIT has exposed her to a great community of wonderful "out of the box" thinkers with different perspectives and the common passion. "This award recognizes Andrew's dedication and service to the RIT community; including his impact on student success and his demonstration of outstanding leadership skills. This award not only honors Andrew for his successes, but also expresses our appreciation for his support of the University." 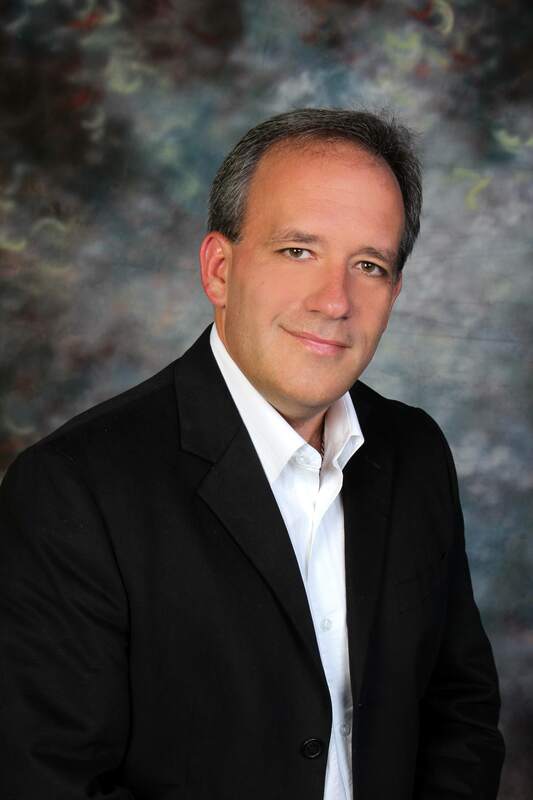 Andrew Brenneman received a bachelor's degree in Business Management (1988) from the E. Philip Saunders College of Business, Rochester Institute of Technology and an associate degree in accounting (1986) from the National Technical Institute for the Deaf. While in college, Andrew served as a peer tutor for the Saunders College of Business and General Education Learning Center. He was the first deaf member of RIT's Alpha Sigma Lambda Honorary Society, which recognizes academic achievement and leadership in college organizations. In addition, he was the corresponding secretary for a fraternity and served as the business manager for the Student Television Network. Andrew is currently a Senior National Account Executive with Sprint Nextel based in Reston, Virginia. He has been with Sprint for nearly 15 years and is currently responsible for nationwide sales and customer relations for Sprint Relay, including acquisition and retention of state, federal and national offerings through competitive bid procurements. Andrew began his career with Sprint as an Account Manager and was promoted to National Account Executive. He is a four-time recipient of Sprint's President's Club Award, given to the top one percent sales performers company wide. Prior to Sprint Nextel, Andrew worked on Wall Street for JP Morgan & Company, Inc. He was recruited after college into the firm's prestigious Management Training Program and held several positions, the last of which was as a Business Support Analyst. Andrew is a past member of the Advisory Board of Visual Language Interpreting, Inc., and served on the Alumni Campaign Leadership Committee for NTID, and is the first deaf alumnus to serve on the RIT Board of Trustees. He is also Chair of the RIT Building and Grounds Committee. Andrew just completed his term as the Chair of the NTID National Advisory Group (NAG) and continues to serve on the NAG. 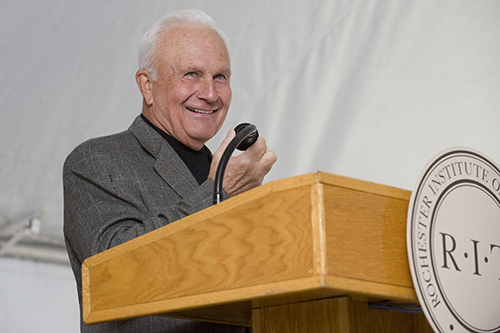 He received the NTID's Distinguished Alumnus Award in 2007. He is also a member of the Nathaniel Rochester Society and continues his volunteerism through community speaking and various service ventures. Andrew was born and raised in Camillus, NY. He is married to Mary (Fracassini), also a graduate of RIT/NTID. They reside in Leesburg, Virginia, with their two children, Andrew and Hannah. In Andrew's own words, "RIT/NTID holds a special place in my heart because of the fine people that I have been associated with at the Institution. With many of them I have created life long friendships. RIT's reputation, academic excellence, and fast paced environment prepared me for the competitive workforce which in turn has led to a successful career." "This award recognizes Vicki's dedication and service to the RIT community; including her impact on student success and her demonstration of outstanding leadership skills. This award not only honors Vicki for her successes, but also expresses our appreciation for her support of the Institute." Victoria Griffith, CAST '93 has been awarded the Alumni Volunteer of the Year Award for 2009. Vicki received her bachelor's degree in Food Marketing and Distribution from the School for Hospitality and Service Management. She has developed that degree into a successful twenty year career in the service industry. She is currently Director of Quality Assurance at Clyde's Restaurant Group, a Washington, D.C. institution for more than 40 years. Since graduating in 1993, Vicki has worked with three RIT presidents helping to transform the alumni experience into one that mirrored her student experience. As soon as she graduated, she began coordinating chapter events in the D.C. area, and has taken on increasing responsibility for representing the Washington alumni voice at her alma mater. Today, she serves on the Alumni Association Board of Directors, is an Nathaniel Rochester Society member and serves on the society's committee as well. She says she's just getting started. "I would go back in a heartbeat. At one point I held four jobs, a full class load, made dean's list on occasion, couldn't wait for hockey Friday nights, was President of the Fraternity, and head of the RITz Dinner planning. I always chuckled at some that said there was nothing to do at RIT. Like many things in life, RIT was what you made of it. There were, and still are, such great opportunities to experience RIT." "This award recognizes Mike's dedication and service to the RIT community; including his impact on student success and his demonstration of outstanding leadership skills. This award not only honors Mike for his successes, but also expresses our appreciation for his support of the Institute"
Michael Morley graduated from RIT in 1969 with a BS in Business Administration from the E. Philip Saunders College of Business. Those who know Mike know that he truly embodies the qualities of commitment, success and philanthropy. Mike began his lifelong relationship with RIT when he was a part of Eastman Kodak’s shift workers program in the 1960s. At the time Mike was working full time at Kodak and this program allowed him to pursue both his career as well as a college education. With encouragement from his wife, Jean, he took a leave from work and pursued his studies full time. Following graduation, a re-energized Mike returned to Kodak, where he has since had a long and distinguished career. At Kodak, Mike quickly rose to the highest senior-level positions, including Vice President and General Manager of Consumer Imaging in the US and Canada, Senior Vice President and Director of Human Resources, and Executive Vice President, and Chief Administrative Officer. Additionally, Mike has channeled his considerable talent and energy toward the betterment of his community. He has served as Chairman of the Board for Family Service of Rochester, Industrial Management Council, and the Rochester Health Commission, along with many other organizations. Currently, Mike is Chairman of the Board of Trustees at RIT, Chairman of the Investment Committee at Via Health, and board members of Rochester Area Community Foundation and the Al Sigl Center, to name a few. While reflecting on his long association with RIT, Mike says, Through my many committee assignments, including Chair of the Board of Trustees, I have been involved in several efforts that have helped me in my work and in the community. The strong sense of ethical behavior is perhaps the most important result of my RIT experience. In addition Mike credits RIT with providing him the skills and confidence that has been so important to my success. Mike and his wife Jean have been married over than 44 years and have three grown Children, Michele Katy and John, along with three grandchildren. "This award recognizes Bob's dedication and service to the RIT community; including his impact on student success and his demonstration of outstanding leadership skills. This award not only honors Bob for his successes, but also expresses our appreciation for his support of the Institute." With a degree in chemistry from RIT (1956) and a Ph.D. in metallurgy from Iowa State University (1960), Bob began his post-college career as a research engineer for Ford Motor Company, followed by a stint as a research scientist for American Standard Inc. After only six years in industry, he joined the RIT faculty in 1967, just before RIT moved from downtown Rochester to the Henrietta campus. In 2001, after 34 years with the mechanical engineering department, Bob retired from RIT. Over the years, Bob influenced hundreds of students and earned many accolades from students and peers alike: the Eisenhart Outstanding Teaching Award, 1979; the Distinguished Alumni Award, College of Science, 1983; the Materials Engineering Institute of ASM International (formerly the American Society for Metals) Distinguished Educator, 2000. Now as professor emeritus, Bob maintains strong ties with RIT, serving on the Alumni Network Board of Directors and volunteering for the Rochester Alumni Chapter. In 1991, he and his wife Norma became charter members of the Nathaniel Rochester Society, and together they have established two generous scholarships for deserving undergraduate students. Last year Bob was a Reunion Volunteer, ensuring that the class of 1956 enjoyed a successful gathering at Brick City Homecoming, and he currently serves on the Membership Committee of the Alumni Network Board of Directors, acting as the committee's "gentle voice of reason." Beyond the RIT campus, his heart and hands work for the good of others through Habitat for Humanity and at the Ronald McDonald House where he's affectionately known as "Mr. Fixit."